→ Has anybody ever added backdrops for battle scenes? Has anybody ever added backdrops for battle scenes? I've taken a break from messing with pokemon gbc titles and have been playing a bunch of fan hacks for the gba games. 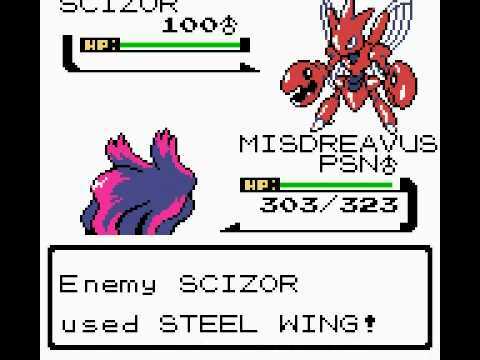 While I still think there is charm to the old gbc graphics and really like the pokemon sprites from crystal, I feel the white backgrounds in battles are fairly jarring and ugly. Has anyone ever added basic water/forest/mountain/inside backgrounds to the battles? Re: Has anybody ever added backdrops for battle scenes? TRE2 is the only one I've ever seen to do that. It's difficult since, if I remember correctly, the Pokemon sprites ARE the background as far as the gameboy is concerned, and the animations are the sprites. So you just have to make it show backdrops around them creatively while still leaving the Pokemon in a white background. Looking at screenshots like this, it seems like that would be pretty much impossible. There's no way to add a "3rd" layer of sorts behind the current "background"? Sorry if this is a foolish question, I don't know anything about if that's reasonable. If there is a way to do that, I certainly wouldn't know how. Edit: TRE2 has battle backdrops in a way, but COMPLETELY redid the entire battle scene as well. Yeah I went and looked up TRE2 but he did it by keeping the background in black and white, which I don't think looks very good either. Would Comet know anything about this or is that outside of what he does? No idea. Wouldn't hurt to ask him, though. You can colorize the screen on SGB, the problem is that you don't have the same versatility as with CGB. You have four available background palettes, two of which are used in battle to colorize the two sprites while the other two colorize their respective life bars. This restricts you to fill the background with objects but I'm not sure how you're going to deal with attack animations then. Of course, you could always colorize the background based on the color of the pokemon in play but that's probably not what you want. The text and background use the same palette as your Pokemon's back sprite. Actually, I'm thinking that you could use the HP bar palette for the background as long as you're fine with only three colors available. Just that all the fading or attack special effects won't probably look good since you'd be mixing the HP bar and background colors, but this is the only instance I can think of where the HP bar would require any of the other three colors. The text and background use the same palette as your Pokemon's back sprite..
Textbox? really? you better look for it first.And HP bar color used 2 slots, one for your pokemon and for your opponents, it still on my mind even that I never hacked a gbc rom again. Yes, each of the two HP bars use a different slot of the four available, but both of them rotate between the same three palettes which are white/yellow/green/black, white/yellow/orange/black, and white/yellow/red/black, of which only the third color is ever used except for special effects that shift the colors of all palettes around. Whatever the case, you'd only need one of the slots to double up as the background palette. As you can see, there are four palettes. Enemy's hud, player's hud, enemy's pic, and player's pic, with the player's pic one being used for the text box area as well. The main issue is that there's really no background, just images that aren't transparent, so to speak. Everytime you animate or draw a pic you'd have to redraw the background tiles and reassign palettes, which makes it quite hard. And all of this making sure that the backgorund never overlaps with the non-white (i.e. non-shade 0) sprite or hud tiles.